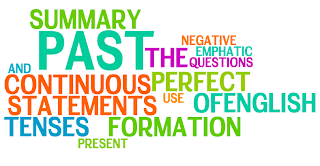 The Past Continuous tense is used to express continuous, ongoing actions which took place in the past. In the following examples, the verbs in the Past Continuous tense are underlined. e.g. He was traveling in Europe last summer. They were playing tennis yesterday afternoon. The Past Continuous tense is frequently used to refer to an ongoing action which was taking place when something else occurred in the past. e.g. I was washing the dishes when the telephone rang. We were entertaining friends when the parcel arrived. In the first example, the use of the Past Continuous tense indicates that the action of washing the dishes was taking place at the time when the telephone rang. In the second example, the use of the Past Continuous tense indicates that the action of entertaining friends was taking place at the time when the parcel arrived. As is the case with other English tenses, questions and negative statements in the Past Continuous are formed using the auxiliary. They were working. Were they working? I was working. I was not working. They were working. They were not working. In spoken English, the contractions wasn't and weren't are often used. Was I not working? Wasn't I working? Were they not working? Weren't they working? I was working. I was working, wasn't I? They were working. They were working, weren't they?